My Watermelon Moon: A new technique!! I stamped all over the white card stock with one of my Close to my Heart sets with Archival Black ink also from Close to my Heart. Then watercolor painted. For these flowers it's nice because the strokes can vary. I just love how this turned out and I have some other flower sets that need a similar treatment! This has been posted at Skip to my Lou Made by you Monday! 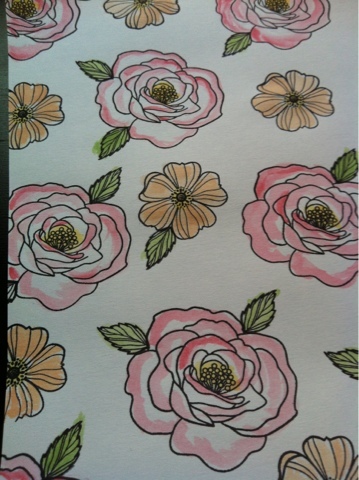 Labels: Close to my Heart, Watercolored flowers. I am so happy to hear I gave you a little inspiration. Very nice job! I also used Designs by Sarah for my blog. Wonderful blog.